After a long silent hiatus, now some good news! Development proceeded, but I did not announce anything since the code was too buggy. Two were the areas of change since the ancient 0.1 release: threads and socket core. I want FTP to have a worker thread during file transfers, else the user interface is unresponsive, which is barely acceptable on the Macintosh and unusable on GNUstep, where there wasn't even a progress refresh. My first attempts called the gui from the worker threads which gave problems on GNUstep. Now with DO, the controller separation is need and works very well. I rewrote the core data transfer mechanism, which previously was in typical BSD style where sockets where used as standard files, which a more portable recv() approach. Together with some tweaks and macros this means that socket operations work on Windows! FTP is thus now able to work on windows too, I attach a screenshot. Thus it came to an end, AlemanniaStep, that is. Thanks to a prepared schedule of topics, the short time was exploited well. We had an interesting demo of the development of various handheld devices by Nikolaus and we had some discussion about how to market ourselv better, how to improve the SoftwareIndex and our problems with packaging in distributions. The rest was dedicated to hacking (as we see in the Picture, Fred fixing weird Font stuff that SWK triggered). Fred and I fixed the backend and Terminal bugs, Nikolaus hacked on SWK and I tested it on both Mac and GNUstep providing continuous feedback and it indeed improved. 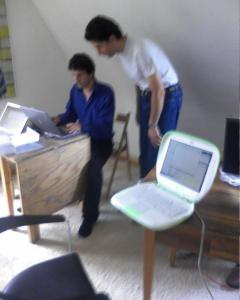 Another session was dedicated to porting and checking of FlexiSheet, which we got finally compiling on the Mac, although with some compromises. Although not ready, it is foreseeable to adapt some pieces so it will run under GNUstep. Gerold found some issues with PCH on debian and made a good proposal in improving FTP after testing it. These activities consumed quite some time, thus there was little time for windows. Also because one of the bugs didn't reproduce as expected. I'll write about results in the next future, when they get a bit more finalized. Here we are in Freiburg, with Fred, at AlemanniaStep. Few people came, but those that came are good. Let's hope in a lot of new ideas, bug fixes and development.